On Saturdays, or on popular horse racing events, Skybet normally runs a “Money Back If 2nd Or 3rd” promotion on the first race of the day. If you place a bet on a horse, and if it finishes 2nd or 3rd, you’ll get your stake back as a free bet, up to £20. Your expected profit from this offer is usually £3. Back £20 on a strong favourite horse (low odds) which close odds to the exchange. Lay your chosen horse using Normal in the calculator. By choosing a lower odds horse, it is more likely to finish 2nd or 3rd. A horse with odds of 8.0 might be unlikely to finish 2nd or 3rd, however, a horse with odds of 3.0 or 4.0 might be more likely to finish 2nd or 3rd, which would give us a refund. 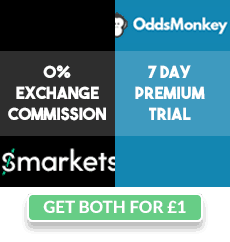 Try to get a qualifying loss of less than £1.50, to maximise your expected value from this offer. If your horse finishes 2nd or 3rd, you’ll get £20 in free bets, credited within 24 hours. Use the free bet and lay it on the exchange in SNR mode on the calculator. How Often Will My Horse Finish 2nd or 3rd? To calculate the chances of your horse finishing 2nd or 3rd (to get our free bet! ), you can check out this page here. The best horses to place our bet on are horses with odds between 2.0 and 6.0. If a horse has odds from 2.0 to 6.0, it will have a 30% chance of finishing 2nd or 3rd, which will give us our refund. Based on this, we’ll have an average of 30% * £20 = £6 free bet for every time we take this offer. A £6 free bet is the equivalent of £4.50 cash (75% free bet retention). If we had a £1.50 qualifying loss, this would mean that our expected profit for this offer is £3. That means that every time we take this offer, we’ll end up with an expected profit of £3 on average. Skybet are running their Money Back if 2nd or 3rd promotion on the 1:50 Royal Ascot. Cardsharp is the favourite, with back odds of 2.5 and lay odds of 2.6. Hold Sway is the 2nd favourite, with odds of 4.5 and lay odds of 4.8. Melodic Motion is the 3rd favourite, with odds of 6.5 and lay odds of 7.2. We choose Cardsharp because it is the clear favourite and it has the lowest qualifying loss of the 3 horses, which is £1.01. Cardsharp’s odds are also between 2.0 and 6.0, which gives it a 30% chance to finish 2nd or 3rd. We place a £20 bet on Cardsharp, and lay it on the exchange on Normal mode on the calculator. If Cardsharp finishes 2nd or 3rd, we’ll have our £20 refunded to us as a free bet. We can use the free bet on another horse and lay it on SNR mode on the calculator, which can give us around £15 in cash! Cardsharp has a 30% chance to end up 2nd or 3rd, so our expected profit here is (30% * 15) - £1.01 = £3.49.